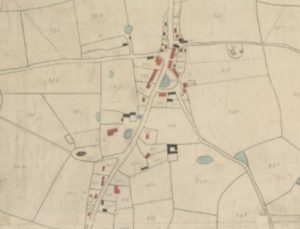 East Hoathly tithe map, 1839. East Sussex Record Office: TDE 48/1. East Hoathly is a small village located in central East Sussex. It lies just over four miles south east of Uckfield, off what is now the major route running south eastwards towards Eastbourne. To the north and east the landscape is dominated by the rolling hills of the High Weald and to the south the South Downs. In the eighteenth century the parish encompassed some 2,000 acres of woodland and mixed agricultural land together with numerous ponds. Most of the parish was divided into small farms occupied by tenants renting from local landowners including the wealthy and politically influential Pelham-Holles family. During the eighteenth century East Hoathly contained only a handful of houses, largely clustered around the conjunction of roads at the centre of the parish. The church lay just to the south-west of this centre. However, the parish also incorporated a number of small hamlets with a scattering of houses including: Grays, Blackboys, Whitesmiths, the Nursery and Halland. By 1801 the whole of the parish contained only 56 domestic houses, occupied by 76 families. Over the next forty years the number of houses doubled, so by 1841, 119 houses were recorded in the parish. During the same period, 1801-1841, the population of the parish rose from 395 to 607. In 1841 only 31 out of the 607 inhabitants were recorded as having been born outside of the county, suggesting a reasonably stable population with relatively few in-comers. The church and the rector were central to village life, but the clerical living was not particularly generous. By 1872 it was worth only £261 per annum. In addition, the church was in increasingly poor repair and in 1856 it was demolished in favour of a new building. From 1752 to 1794 the rector was Thomas Porter. Porter had followed his brother, Richard, into the living and remained there until his death at the age of 74. He also held the nearby living of Ripe. 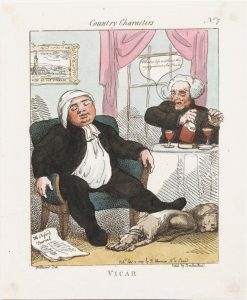 According to the diarist Thomas Turner, Porter was an outgoing-man, and was often the centre drinking parties that went on into the small hours of the night. At the same time, Porter was also apparently assiduous in performing his clerical duties, although these were admittedly light. There were no more than a dozen baptisms a year during the eighteenth century and sometimes as few as four. But by the nineteenth century, this had risen to between ten and twenty per year. Marriages remained fairly constant at two to four a year, while burials amounted to less than a dozen per year. Porter was also quite diligent in pursuing his extra-clerical business, acquiring significant parcels of land and property in the area. 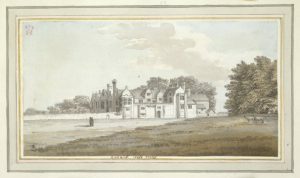 While in many ways East Hoathly was an unremarkable rural parish in southern England, it is notable as the home of Thomas Turner, shopkeeper and prolific diarist of the mid-eighteenth century. Turner was twenty-one when he first came to the parish in 1750. He married Peggy Slater in 1753 and the first of his surviving diaries date from 1754. Turner initially came to the parish in order to run a small general shop. At first he rented premises in the centre of the village, purchasing the property shortly after 1765. But Turner was much more than just a shopkeeper. He threw himself into parish life and administration. His meticulous accounting was put to good use in service of the village. He briefly kept the local school and later became both a churchwarden and overseer of the poor. He also acted as occasional surveyor, assisted the local tax collector, wrote wills, gave advice and acted in law on behalf of many of his neighbours. All of this was carefully noted in his diaries, together with vivid accounts of the everyday life of the parish. The last surviving volume ends in July 1765. Other than the church, the parish supported the general shop run by the Turner, a small school and at least two public house, one of which was the King’s Head. However, the overseers’ vouchers make it clear that several other craftsmen and women were operating in the parish, including shoemakers and cobblers, a butcher, a miller, carpenters, builders and blacksmiths, together with tailors and seamstresses. These were augmented by local petty officials: for instance the excise officer, postmaster and schoolmaster, most of whom had dealings with Thomas Turner in his capacity as churchwarden or overseer of the poor. In the early nineteenth century there was a slight drift away from the agricultural occupations that dominated the parish workforce, with a growing number concerned with ‘trade, manufacture or handicrafts’. The numbers recorded in this census category grew from 15 families in 1801, to 35 families out of 97 in 1831. The largest house in the parish belonged to the Duke of Newcastle. The family seat, Halland House, was located in the hamlet of Halland, and straddled the parish boundary with the adjacent parish of Laughton. By the later 1760s the Elizabethan house was dilapidated and was substantially demolished. What remained, continued to be used as a generously proportioned farm house. Despite the attendance of notable members of the aristocracy, judiciary and political allies of the Duke at such events, Turner commented in his diary that the celebrations ‘might be more properly done by distributing something to the poor.’ Charitable donations by the aristocracy were commonplace in the eighteenth century and often distributed through the local overseers of the poor including gifts of food and fuel. 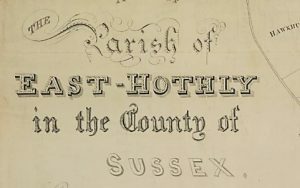 Thomas Turner was assiduous in noting their distribution in East Hoathly. In common with many small rural parishes East Hoathly did not maintain a workhouse and cared for its poor in the community. Pensions were paid to a small group of regular, often elderly or otherwise infirm paupers. Food stuffs, clothing, footwear and fuel formed regular components of parochial support. 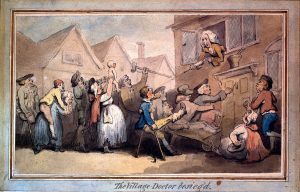 The village doctor besieg’d, Thomas Rowlandson. Wellcome Library no. 10978i . The parish also provided medical care and medicines for the needy poor. A local apothecary or surgeon provided treatment and dispensed medicines when called on to do so by the overseer of the poor. Occasional ad hoc payments were made for specific items and small sums given to the itinerant poor. At least one parishioner was supported in Bethlem Hospital, an institution for the insane poor in the City of London. A number of illegitimate children and babies were maintained by East Hoathly parish. These infants were boarded out locally and subsequently apprenticed, usually in an adjacent parish. In addition, the parish ensured that repairs were made to cottages and other dwellings that housed their impoverished men and women. Labouring work was given to the able poor particularly when these cottages or the church required maintenance. In the year ending Easter 1776 East Hoathly raised £199 through the Poor rate. By Easter 1803 this had more than doubled to just over £418. Of this, £358 was spent on relieving the poor and a further £13 on the removal of paupers, overseers’ expenses and legal costs. In 1803 the parish was permanently caring for 22 adults, 3 children under 5 and a further 13 children between the ages of 5 and 14. For a fuller biography see David Vaisey. 2004 “Turner, Thomas (1729–1793), diarist and shopkeeper.” Oxford Dictionary of National Biography. 14 Aug. 2018. http://www.oxforddnb.com/view/10.1093/ref:odnb/9780198614128.001.0001/odnb-9780198614128-e-48266. Thomas Turner, The Diary of Thomas Turner, 1754-1765, ed. David Vaisey, New edition (East Hoathly: CTR Publishing, 1994), 161. Naomi Tadmor, Family and Friends in Eighteenth-Century England: Household, Kinship and Patronage (Cambridge: Cambridge University Press, 2001), 85–89. To the nearest whole English pound.